Every small business needs a written operations manual. It is absolutely essential. It does not have to be large and comprehensive, it just needs to be useful. Here are 5 reasons why your business needs this. Most business owners start their businesses because they believe that they can do a superior job at what they do. Their intent from the beginning is excellent products and/or customer service. However, as a business grows and new employees are added to the mix, the quality often diminishes. If the owner gives a customer one experience but the employees give that same customer a sub-par experience, it will confuse the customer and lower the customer’s opinion of the business. A written operations manual will help give you and your team the discipline to do what it takes to maintain excellence as the business grows. Unfortunately most business owners do not have a strong process for training new employees. They typically walk them around the place of business showing them where everything is. They then tell them what they need to do and then expect that new employee to intuitively do what they were told with excellence. Often the new employee is a disappointment to the owner. If there is a manager responsible for the orientation and training of the new employee the results can be even worse. As I’ve already mentioned, a well-written operations manual will set the standard for performance. It will also give detailed procedures (how-to’s) on the critical functions of the tasks the new employee is responsible for. Mentoring is always a great idea, but an operations manual is essential as both a standard and a reference tool. Most small business owners feel like they do not have enough time to do the higher level, more strategic functions of their business. They lament that they do not have time to plan and think strategically. I frequently hear that their time gets consumed putting out fires and solving problems. This typically happens when the company does not have a good operations manual. A few years ago I had a wonderful client who started working with me. She said that her goal was to never be asked another question by her employees. She realized that SHE was the company operations manual and everyone constantly came to her for instruction and permission on everything. It was literally driving her nuts! In the end she created a comprehensive operations manual (with the help of her team) that answered almost every question any employee would have. It also gave her the assurance that things would be done in the proper manner. She was able to relax more and found that she had a lot more time to do the things that she wanted to do! Operations manuals, once written, are a tremendous time saver! The common business owner adage is this, “If you want it done right you must do it yourself.” Have you ever said that? There is some truth to this statement, but what if you had a checklist or a detailed procedure for your employee to follow – and then of course you held them accountable to follow the checklist or procedure? I guarantee, the job would be done right! If you as the owner have to do everything for it to be done right, your business is not scalable. It cannot grow beyond the time that you as the owner have to “do everything.” You must create systems that are documented in an operations manual for your business to grow in a healthy, sustainable way. In his excellent book Built to Sell, author John Warrillow reports that 99 out of 100 businesses in America are not sellable. The reason? The business is too dependent on the owner. In other words, the business is not a transferable asset or system. The owner is the system, and without the owner the business has little or no value. What will make your business valuable and sellable is to have well-designed, well-documented systems that almost anyone can operate successfully. The more your business looks like this, the less dependent it will be on the owner, and the more asset value your business will have. As a business coach in Sugar Land, Katy, and the Houston area, I help business owners create turnkey businesses that they can one day sell. The key tool we create is a powerful operations manual. Contact us today for a FREE 1-hour strategy session on how you can create a turnkey business! 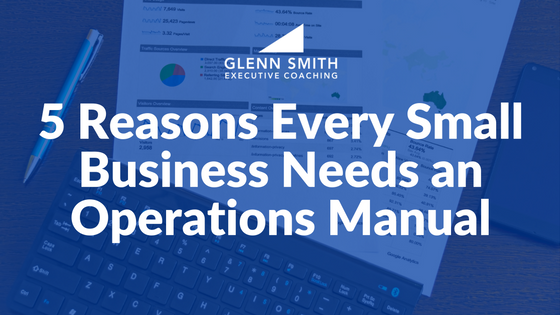 An operations manual is essential for every business, especially the small business that wants to grow. Here are 5 reasons your business needs one.